Starting on March 16, the Arts and Science Federation of Associations will be holding a referendum to decide its structural fate, possibly eliminating the association’s culture of throwing large parties. ASFA represents approximately 14,539 students within Concordia’s Arts and Science programs. The federation is looking to restructure through a series of bylaw changes. It’s also looking to secure a fee-levy increase of $0.14 per credit, and is asking for permission to contribute $0.10 per credit to the Hive Free Lunch Project. Minimum voter turnout needed is 363 students—2.5 per cent of the Arts and Science student body. 1. Do you as a member of the ASFA approve of the ASFA indexing its fees (currently $1.22/credit) to inflation in accordance with the Consumer Price Index ($1.36/credit), effective fall 2016? Having recognized five new member associations over the past year—for a total of 31 member associations within the federation—ASFA is looking to increase its funding. The $0.14 per credit increase will help member associations with costs like food and merchandise that have gone up since 2008. The federation attempted to increase their fee-levy in a November 2014 referendum by $0.38 per credit in order to offset an expected deficit of $61,690. The question did not pass. The fee-levy does not consistently rise with inflation, but due to the need for more funding, the ASFA executive team decided that raising it in accordance with inflation was the most reasonable way to calculate the increase. 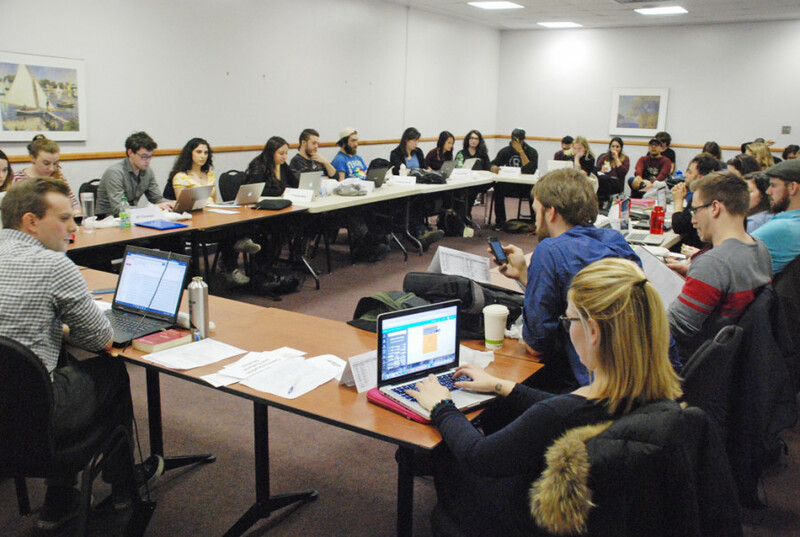 According to General Coordinator Jenna Cocullo, the federation isn’t in financial trouble yet, but wants to increase its fee-levy to avoid future troubles. At a regular council meeting on March 10, sustainability coordinator Lana Galbraith hinted that the federation was suffering from an increasing deficit. 2. Do you, as a member of the ASFA, approve of ASFA giving $0.10/credit towards the Hive Free Lunch Project, effective fall 2016? If approved, the $0.10 per credit will go towards helping fund the Hive Free Lunch Project, which serves vegetarian or vegan food every weekday at the café on Loyola campus between 12:30 and 1:30 p.m. The money will not go to ASFA, or the Hive itself—it is meant solely to support the Free Lunch Project. 3. Do you agree to the following bylaw changes? These bylaw changes are meant to help combat the so-called “toxic atmosphere” within the federation. The restructuring is an attempt to give more autonomy to member associations by turning ASFA into a “funding body” rather than a “big association.” The executives will be shaved down to three positions—advocacy coordinator, finance coordinator and internal coordinator. Without a social coordinator, the ASFA executive will no longer have a mandate to host social events, which have been some of the most criticized aspects of the federation. Executives would also be appointed to power—but only once member associations hold general assemblies to vote on the potential appointees. An extra independent member association would be created to accommodate departments that don’t already have representation on council. If this question passes, there will be an immediate callout for candidates to fill the three coordinator positions. Their mandates would officially begin on May 31, according to Cocullo. Correction: in a previous iteration of this article, it stated that minimum voter turnout needed was around 600 students. It has come to The Link’s attention that quorum for ASFA referendums is 2.5 per cent, which is currently about 363 students. The Link regrets the error.